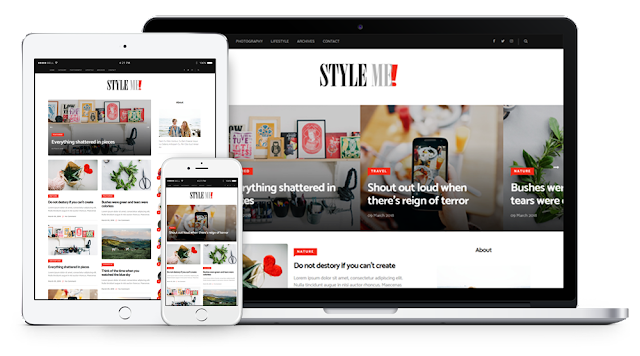 Style Me-Responsive Magazine Blogger Template is a best choice for your website. which will easily adjust your blog content. With custom tools, such as widgets, social media widgets, selected posts, etc. you can bring your best blog content. And optimizing the theme for super will make it easy to personalize theme colors. Another good thing to add here is a logo file that you can easily use with Photoshop. Style me free blogger templates Optimized Blog ,Optimized SEO is It's built on the latest technologies like HTML 5 and CSS3. During the creation of this template, we remember that instead of making it beautiful, we should work on our performance. Each element of this topic is well prepared and your website creates a professional website and you get maximum exposure for your content. This is the latest model to download until it fits all kinds of blogs. Style me is a great premium blogger's unique template,. Style me is a great for online professionals or a creative person who wants to display their unique articles in a modern way. This is a great way to portray your unique objects.